Excretory urography in a patient with diabetes. A film obtained at 5 minutes shows horns from the calices, ring shadows, and an egg-in-a-cup appearance (ring sign) characteristic of renal papillary necrosis. Excretory urography in a 53-year-old man with analgesic-induced nephropathy. A film obtained at 15 minutes after administration of contrast shows a wavy renal outline with tracks of contrast extending from fornix, ring shadows caused by the sloughing of papillae, and an egg-in-a-cup appearance characteristic of renal papillary necrosis. Note the bamboo spine, characteristic of ankylosing spondylitis. Excretory urography in a patient with renal papillary necrosis and pyeloureteritis cystica. Note the bilateral loss of the renal mantle with contrast tracking from the renal fornix in the lower pole of the right kidney. Note also the multiple smooth filling defects in the ureter, caused by ureteritis cystica. On excretory urography, persistent streaking of contrast from the fornix at the upper and lower poles is almost diagnostic of renal papillary necrosis. Necrosis in situ is difficult to diagnose because the necrotic tissue does not slough. Retrograde pyeloureterograph images are sensitive, especially in the presence of renal impairment or when urographic findings are inconclusive. Computed tomography (CT) scan findings are not diagnostic but may be useful in assessing urinary tract obstruction, hemoglobinopathies, and cirrhosis; these conditions are recognized causes of papillary necrosis. Magnetic resonance imaging (MRI) findings are nonspecific in cases of papillary necrosis, although MRI may be useful for patients who are allergic to iodinated contrast medium because gadolinium may provide a useful alternative. Gadolinium-enhanced MRI is a useful alternative for patients with renal failure. Gadolinium-based contrast agents have been linked to the development of nephrogenic systemic fibrosis (NSF) or nephrogenic fibrosing dermopathy (NFD). NSF/NFD has occurred in patients with moderate to end-stage renal disease after being given a gadolinium-based contrast agent to enhance MRI or MRA scans. NSF/NFD is a debilitating and sometimes fatal disease. Characteristics include red or dark patches on the skin; burning, itching, swelling, hardening, and tightening of the skin; yellow spots on the whites of the eyes; joint stiffness with trouble moving or straightening the arms, hands, legs, or feet; pain deep in the hip bones or ribs; and muscle weakness. Radioisotope scanning provides a sensitive index of renal function. On plain radiographs, necrotic papillae may occasionally demonstrate a ring of calcification. On excretory urography, the ulcerated papillae may be observed. Sloughed papillae may cause filling defects within the calyx, pelvocalyceal system, or ureter. Retrograde pyelography may be helpful when the renal collecting system opacifies poorly or when renal insufficiency is present. On ultrasonography, sloughed papillae may appear as echogenic material within the collecting system; this is a nonspecific finding. Correlation with clinical and laboratory findings help distinguish renal papillary necrosis from other renal abnormalities that have similar features on ultrasound and that are associated with areas of increased echogenicity (eg, nephrocalcinosis). No major role exists for CT and MRI in the evaluation of renal papillary necrosis. The usefulness of reformatted multislice spiral CT has yet to be determined. CT findings are not diagnostic but may be useful for patients with poor renal function in whom intravenous urogram radiographs are of poor resolution. Findings of a medullary cavity and calcification are nonspecific. MRI is an expensive tool, but it may be useful for patients with poor renal function and for those who experience hypersensitivity to iodinated contrast media. Radioisotope studies play a significant role in evaluating renal function, but they provide little anatomic information on the location of lesions. Calcification in a sloughed papilla is characteristically ring shaped and may be the only abnormal radiologic finding in cases of necrosis in situ. Calcification is common in patients with analgesic-induced papillary necrosis; it has not been reported in patients who have papillary necrosis associated with hemoglobinopathy. Persistent streaking of contrast from the polar fornix is almost diagnostic of renal papillary necrosis. Necrosis in situ is difficult to diagnose because necrotic tissue does not slough. Filling defects within the pelvocalyceal system and the ureter are nonspecific findings. Opacification of the collecting system is poor when renal function is impaired. Medullary calcification may occur in patients with hyperparathyroidism, renal tubular acidosis, and medullary sponge kidney, as well as patients with hypercalcemia. The presence of ringlike calcifications of up to 5-6 mm in diameter is characteristic of sloughed papillae. 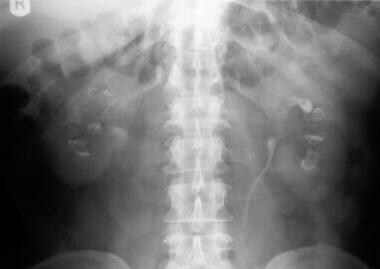 Findings of medullary calcification (nephrocalcinosis) are nonspecific. Calcification may be the only abnormal radiologic finding in papillary necrosis in situ. On plain radiography, the kidneys are normal in size and contour except in the late stage of disease, during which they shrink and demonstrate a wavy contour as a result of the prominence of the septal cortex around the atrophied centrilobular cortex. Sloughed papillae may calcify; on plain radiography they may be observed as curvilinear or ringlike calcification measuring up to 5-6 mm in diameter. The appearance of calcification implies that a change in urine bacteriology has occurred such that Proteus organisms predominate. 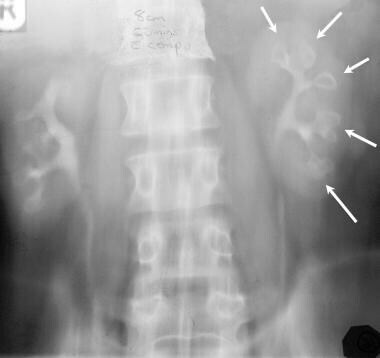 On plain radiographs, tiny calcifications may be observed in the region of the liver, spleen, adrenal glands, and lymph nodes in patients with abdominal tuberculosis. In the early stage, papillary swelling may be the only abnormal finding; papillary necrosis may be difficult to diagnose. Later, necrosis of the papillae, in association with disruption of the urothelial lining, causes tracking of contrast from the fornix parallel to the long axis of the papillae. These developments may produce the lobster claw sign. Cavitation of renal papillae then occurs; such cavitation may be incomplete (medullary) or complete (papillary) and may be either central or eccentric. Shrinkage and sloughing of the necrotic papillae cause forniceal widening and calyceal clubbing. Sloughed papillae cause a filling defect in the pelvocalyceal system and in the ureter. Findings in this modality are similar to those of excretory urography. 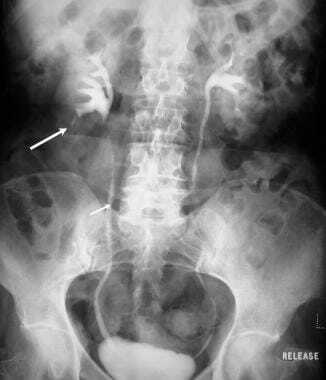 Minor abnormal papillary findings may be demonstrated readily when urographic findings are indeterminate. Retrograde pyelography is sensitive, especially in the presence of renal impairment or for patients in whom urographic findings are inconclusive. The procedure cannot help in the assessment of renal function or the renal parenchyma. In the early stage, when papillary swelling may be the only abnormal radiologic finding, swelling is difficult to recognize. Necrosis in situ cannot be diagnosed unless calcification has occurred. Pyelosinus extravasation, which may occur with forceful injection of a large volume of contrast, may mimic the tracking of contrast from the fornix in papillary necrosis. Inadvertent injection of air bubbles may produce filling defects, but the defects appear smooth and rounded and therefore may be differentiated from the irregular filling defects found in sloughed papillae. CT is sensitive in detecting calcifications and may demonstrate multiple bilateral ring shadows in the medulla, some of which are triangular. Contrast may fill the clefts in the renal parenchyma. The modality may be helpful in evaluating the nature of the material (sloughed papillae)  that causes the filling defect within the collecting system. Findings of a medullary cavity and calcification are nonspecific. Iodinated contrast agents should be used cautiously in patients with compromised renal function. Although CT findings are not diagnostic, the scans may be useful in patients with poor renal function in whom intravenous pyelogram findings are not helpful. Sonographic findings are nonspecific for patients with renal papillary necrosis. Sonographically, areas of cavitation in the papillae may appear as multiple rounded or triangular cystic spaces in the medulla arranged around a renal sinus echo, demonstrating a garland pattern. Occasionally, bright echoes produced by arcuate arteries may be visualized at the periphery of the cystic space. Sloughed papillae may appear echogenic and cast shadows when calcified. The collecting system may be dilated when obstructed by sloughed papillae. A hyperechoic medulla may be observed in patients with hyperparathyroidism and medullary sponge kidney and in patients with conditions that cause hypokalemia or hypercalcemia. No role exists for isotope studies in the diagnosis of renal papillary necrosis; however, such studies are useful in evaluating renal function. Craig WD, Wagner BJ, Travis MD. Pyelonephritis: radiologic-pathologic review. Radiographics. 2008 Jan-Feb. 28(1):255-77; quiz 327-8. [Medline]. Khan U, Kleess L, Yeh J, Berko C, Kuehl S. Sickle cell trait: not as benign as once thought. J Community Hosp Intern Med Perspect. 2014. 4 (5):25418. [Medline]. Kumar S, Ramachandran R, Mete U, Mittal T, Dutta P, Kumar V, et al. Acute pyelonephritis in diabetes mellitus: Single center experience. Indian J Nephrol. 2014 Nov. 24 (6):367-71. [Medline]. Vega J, Goecke H, Méndez GP, Guarda FJ. Nephrotic syndrome and acute tubular necrosis due to meloxicam use. Ren Fail. 2012. 34 (10):1344-7. [Medline]. Dagrosa LM, Ghali F, Gormley EA. Renal Papillary Necrosis Appearing as Bladder Cancer on Imaging. J Endourol Case Rep. 2016 Feb 1. 2 (1):27-9. [Medline]. Pedrosa I, Chou MT, Ngo L, H Baroni R, Genega EM, Galaburda L, et al. MR classification of renal masses with pathologic correlation. Eur Radiol. 2008 Feb. 18(2):365-75. [Medline]. Pedrosa I, Sun MR, Spencer M, Genega EM, Olumi AF, Dewolf WC, et al. MR imaging of renal masses: correlation with findings at surgery and pathologic analysis. Radiographics. 2008 Jul-Aug. 28(4):985-1003. [Medline]. Vijayaraghavan SB, Kandasamy SV, Mylsamy A, Prabhakar M. Sonographic features of necrosed renal papillae causing hydronephrosis. J Ultrasound Med. 2003 Sep. 22(9):951-6; quiz 957-8. [Medline]. Sutariya HC, Pandya VK. Renal Papillary Necrosis: Role of Radiology. J Clin Diagn Res. 2016 Jan. 10 (1):TD10-2. [Medline]. Abrol N, Harshe G, Devasia A. Egg in a cup. Indian J Urol. 2015 Jan-Mar. 31 (1):77-8. [Medline]. Hill SC, Hoeg JM, Avila NA. Nephrocalcinosis in homozygous familial hypercholesterolemia: ultrasound and CT findings. J Comput Assist Tomogr. 1991 Jan-Feb. 15(1):101-3. [Medline]. Saifuddin A, Bark M. Case report: computed tomography demonstration of renal papillary necrosis. Clin Radiol. 1991 Oct. 44(4):275-6. [Medline]. Jung DC, Kim SH, Jung SI, Hwang SI, Kim SH. Renal papillary necrosis: review and comparison of findings at multi-detector row CT and intravenous urography. Radiographics. 2006 Nov-Dec. 26(6):1827-36. [Medline]. Henrich WL, Clark RL, Kelly JP, Buckalew VM, Fenves A, Finn WF, et al. Non-contrast-enhanced computerized tomography and analgesic-related kidney disease: report of the national analgesic nephropathy study. J Am Soc Nephrol. 2006 May. 17(5):1472-80. [Medline]. Gordon M, Cervellione RM, Postlethwaite R, Shabani A, Hennayake S. Acute renal papillary necrosis with complete bilateral ureteral obstruction in a child. Urology. 2007 Mar. 69(3):575.e11-2. [Medline]. Lee JH, Lee KG, Park HK, Song SY, Kim JY, Kim YH, et al. Inflammatory pseudotumor of the kidney mimicking malignancy on 18F-FDG PET/CT in a patient with diabetes and hepatocellular carcinoma. Clin Nucl Med. 2012 Jul. 37(7):699-701. [Medline]. Nephrotomogram in a 53-year-old man with analgesic-induced nephropathy (same patient as in the previous image) clearly demonstrates a wavy contour of the renal outline (ie, renal scars with focal atrophy).